Hi. 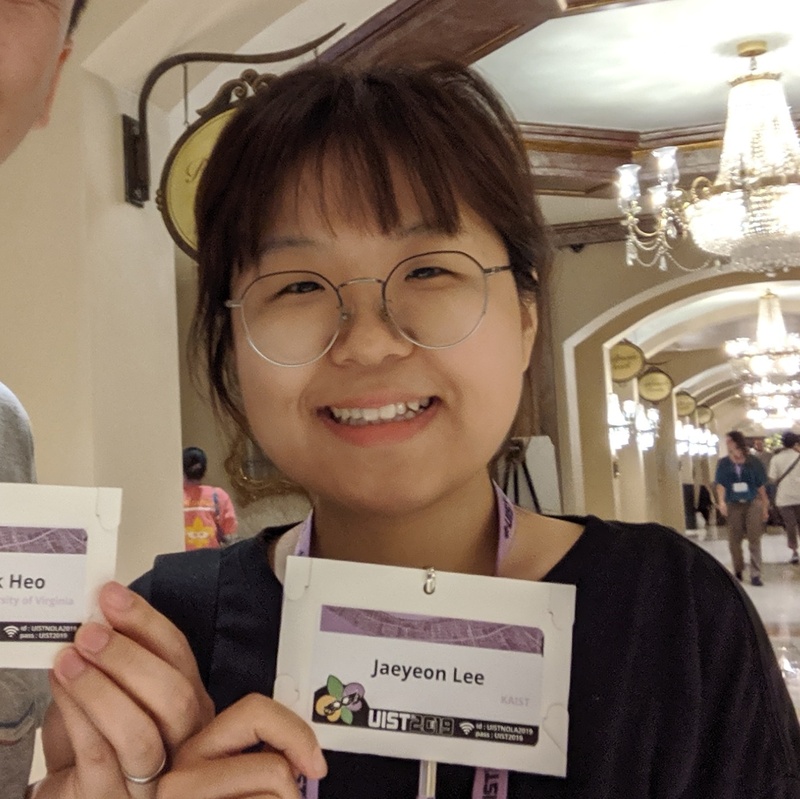 My name is Jaeyeon [JAY-awn] and I am a phd candidate in the School of Computing, KAIST, where I am advised by professor Geehyuk Lee. As a Human-Computer Interaction (HCI) researcher, I have been exploring human haptic perception to body-worn computers including wearable, hand-held devices, and on-skin interfaces. I have published papers on wearable haptic interfaces (CHI'15, UIST'16, CHI'18), smart watch interaction (IJHCS), interpersonal touches in interactive installation (DIS'18). Last summer, I did a research internship at Microsoft Research with Mike Sinclair. Our paper on a VR controller for in-hand interaction got accepted to CHI 2019. Before the internship, I was a visiting student at the HCI Lab (aka the 'iSkin Lab') at Saarland University lead by proferssor Jürgen Steimle. Our paper on the human tactile perception with on-skin overlays also got accepted and recognized with Best Paper Honorable Mention Award. I have my master's degree in Electrical Engineering from KAIST and Bachelor's in Control Engineering from Kwangwoon University. I am a recipient of NAVER phd fellowship 2017. Mar 15, 2019 Award Like A Second Skin receives Best Paper Honorable Mention Award at CHI 2019. Jan 13, 2019 Special Recognition for Outstanding Review at CHI 2019. Dec 11, 2018 Papers All of three submissions have been accepted to CHI 2019. Jun - Aug, 2018 Research Intern at Microsoft Research in Redmond, WA. Jun 12, 2018 Paper Touch Branch was presented at DIS 2018. Apr 25, 2018 Paper Multimodal Watch-back Tactile Display has been presented at CHI 2018. Dec 2017 - Apr 2018 Visiting Student at Professor Jürgen Steimle's Lab in Saarland University, Germany. Apr 9, 2018 Talk at Professor Herbert Shea's Lab in EPFL, Switzerland. Jan 1, 2018 Paper Square Watch Interaction has been published on IJHCS. Dec 19, 2017 Paper Multimodal Tactile Display has been accepted to CHI 2018. Nov 10, 2017 Award Touch Branch wins Outstanding Paper Award for ISSM 2017. Oct 14, 2017 Wedding I married an HCI researcher. Jul 27, 2017 Thesis proposed. Smartwatch has a limited input vocabulary because of its small touchscreen. Using touch sensitive edge as an input is one of the promising solutions. We explored interaction techniques that use the possible combinations of touch sensitive edges and the touchscreen. Interpersonal touch, one of the most primitive social languages, is an excellent design element frequently utilized in interaction design. We built an interactive system that can sense simple touch and interpersonal touches. We observed the interpersonal touches and discussed the effect of social relationship and the spatial distance. This research project was a part of an interactive installation project,Lumi Land (2017), at National Science Museum in Korea. We proposed the idea of layering two disjoint tactile sensations (wind and vibration) together to expand the information capacity of watch-back tactile display. We presented interaction scenarios and the pattern recognition experiment results of multimodal tactile display. Traditional wearable tactile displays transfer tactile stimulations through a firm contact between the stimulator and the skin. We conjecture that a firm contact may not be always possible and acceptable. We explored the concept of a non-contact wearable tactile display using an airflow, which can transfer information without a firm contact. A watch-back tactile display (WBTD) is expected to be a viable supplement to the user interface limitations of a smartwatch. However, its design requires that many design parameters such as tactor types and stimulus patterns be determined. We conducted a series of experiments to explore a best design of a WBTD consisting of 3×3 tactors and presented the results. Jaeyeon Lee, Mike Sinclair, Mar Gonzalez-Franco, Eyal Ofek, Christian Holz. CHI 2019 (accepted). Aditya Shekhar Nittala, Klaus Kruttwig, Jaeyeon Lee, Roland Bennewitz, Eduard Arzt, Jürgen Steimle. CHI 2019 (accepted). Sangyoon Lee, Jaeyeon Lee, Geehyuk Lee. CHI 2019 (accepted). Seungki Kim, Jiwoo Hong, Jaeyeon Lee, Hyunsook Choi, Geehyuk Lee, and Woohun Lee. DIS 2018. Youngbo Shim, Jaeyeon Lee, and Geehyuk Lee. CHI 2018. Seungki Kim, Jiwoo Hong, Jaeyeon Lee, Geehyuk Lee, Woohun Lee, and Hyunsook Choi. ISSM 2017. Jaeyeon Lee and Geehyuk Lee. UIST 2016. Jaeyeon Lee, Jaehyun Han, and Geehyuk Lee. CHI 2015. Jaeyeon Lee and Da Young Ju. ICCA 2013. Jaeyeon Lee, ChangHeun Oh, and HyunWook Park. ITC-CSCC 2012. Sunggeun Ahn, Jaeyeon Lee, Keunwoo Park, and Geehyuk Lee. IJHCS 109 (2018): 68-78. Jaeyeon Lee and Da Young Ju. IJSH 7.5 (2013). Youngbo Shim, Jaeyeon Lee, and Geehyuk Lee. CHI 2018 EA, Demonstration. Jaeyeon Lee. UIST 2017 Adjunct, Doctoral Symposium. Advisor: HyunWook Park, Ph.D., School of Electrical Engineering, KAIST. 1st Prize, Graduation Exhibition, School of Robotics, Kwangwoon Univ. Full Scholarship (for 4 years), School of Robotics, Kwangwoon Univ.